Utah-based Dose of Nature launched a state-of-the-art CBD (Cannabidiol) product line in 2014, applying proprietary technologies to create the first nano CBD and water-soluble CBD products in the market. CBD or Cannabidiol has been at the forefront of the news lately in its application to treat pediatric epilepsy, autism, cancer, pain, PTSD, brain injuries, anxiety, and various neurological conditions. The difference? It’s all about size. With our Hydrosome™ technology, CBD is broken down into molecules that are extremely small, guaranteeing the max amount of delivery to the system in the smallest amount of time. While the traditional pastes and oils are only fractionally absorbed and take hours to reach peak absorption, you can literally feel the Dose of Nature water-soluble nano CBD take effect in minutes. It tastes great, and is nearly 100% absorbed into the system. For individuals with medical needs and limited budgets, because of the increased bioavailability of these unique delivery methods, customers are often able to cut back on dosing while still retaining the same effect. Dose of Nature has released four RedStrap CBD Oil Blends in 100% virgin organic cold-pressed hemp seed oil, coconut oil, apricot oil, and olive oil. The RedStrap CBD oil contains 70% CBD plus the full entourage of other cannabinoids, minus the waxes, resins, and organic matter, rendering a clear, clean, delicious, and more bioavailable form of CBD oil. CBD is a delicious, beautifully golden-colored oil with a slightly nutty flavor. The oil can be consumed orally by placing the drops under your tongue, or you may mix this oil with a salad or smoothie of your choice. Click here for more information. 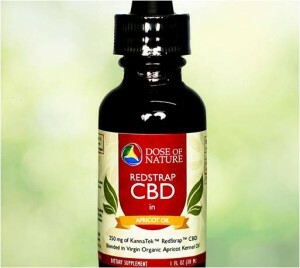 Note: We received a complimentary bottle of Redstrap CBD oil in exchange for writing this post.